Heat milk in a low heat, so that it is condensed to ¼ litre. 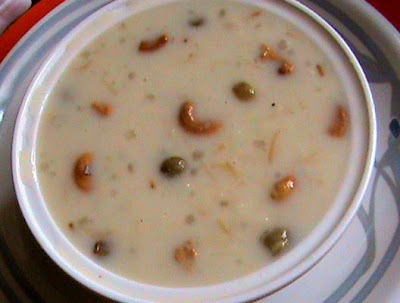 Season cashew, cardamom and raisins in hot ghee. Fry moong dal, javvarisi in ghee and pressure cook it for just 1 whistle. Heat ghee, fry the semiya, aval in low heat and allow to boil with 1 tumbler water. Mash the boiled moong dal, javvarisi and add them to the above contents. Garnish with fried cashew, cardamom, raisins and grated almond nuts. 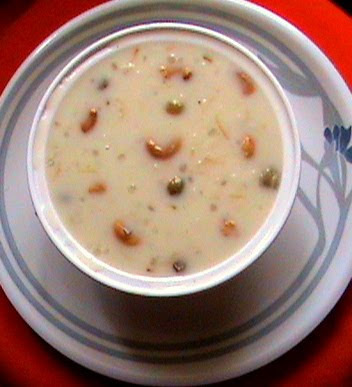 Delicious payasam, ready to serve. Sounds and looks delicious!! Different way of preparing the payasam!